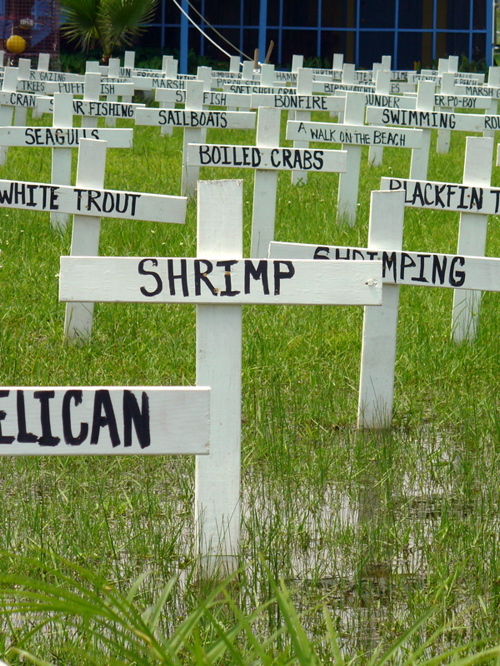 Frustration mounts over a lost way of life in Grand Isle. GRAND ISLE, LA. 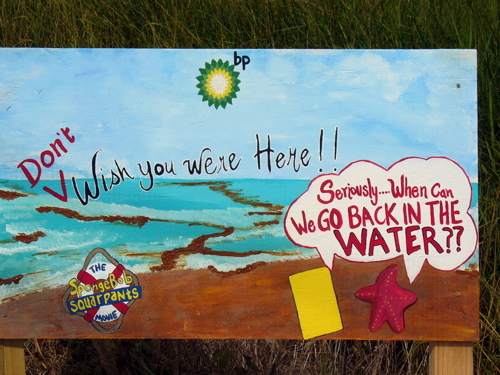 – As you cross the bridge linking the barrier island of Grand Isle to the rest of Louisiana, it’s a local tradition that all who pass “leave their troubles behind.” Now, more than 100 days after the BP oil spill began this tiny island has become trouble central. A sense of the macabre has overtaken this idyllic beach community, located 90 miles south of New Orleans, since the Deepwater Horizon oil platform exploded on April 20th, killing 11 workers, and spewing an estimated 220 million gallons of oil into the Gulf. Ever since paradise has been transformed into a massive disaster-response staging area – all the beaches are closed, helicopters crisscross the sky, BP’s cleanup workers have infested the island in their white hazmat suits, and the words “chemical dispersant” are banned from the lexicon. Locals have voiced concern over the droves of mostly urban African-American and Latino cleanup workers – a race and ethnicity many in this nearly all-white community take note of – because of the increase in disorderly conduct around Grand Isle. While virtually every hotel room is booked with cleanup crews, the charter fishing businesses, restaurants and bars are all suffering through a disastrous summer. Still the residents remain optimistic. Their gallows humor is evident at the Dock of the Bay bar at Grand Isle’s Sand Dollar Marina, where the aptly named Tar Ball Shooter (Jagermeister and grape Jell-O), has drawn steady customers. The scene from the fishing pier at Grand Isle State Park, where all the beaches are closed due to oil encroachment. 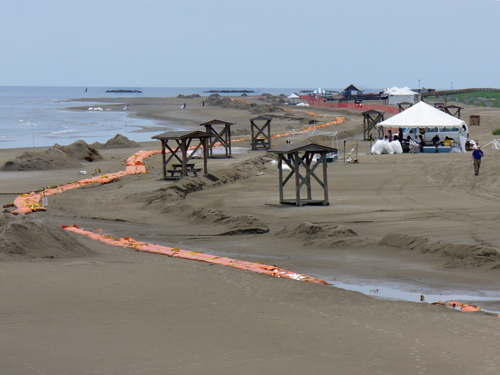 Roughly 1,500 people live on this narrow eight-mile stretch of land year around, but during the peak summer months that number can balloon to 20,000, particularly during Grand Isle’s signature event, the Tarpon Rodeo, which had to be canceled this year for the first time in its 82 year history. There’s little infrastructure on the island, no arcades, movie theaters, or even a McDonald’s. It’s mostly a commercial and recreational fishing community – so if the beaches are closed and you can’t go out on the water Grand Isle ceases to exist as a vacation destination. A murky future faces all who reside amongst the marshlands of Louisiana, but for the permanent residents in this state’s southernmost outpost, the clock seems to be ticking faster. 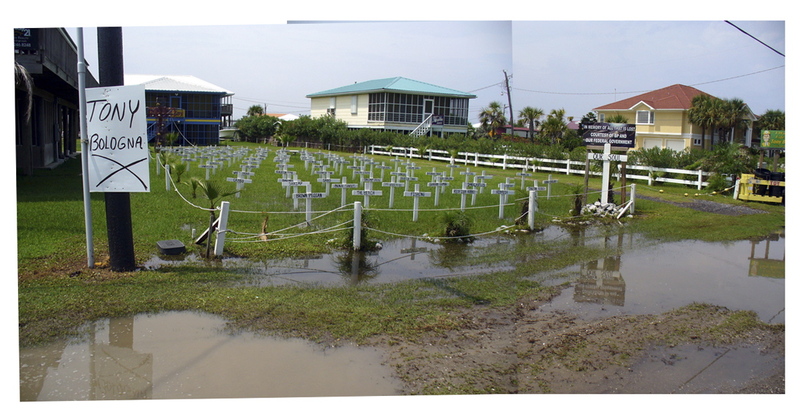 Located on the main drag of Grand Isle, one resident vented frustration at BP by creating a graveyard outside their house to depict each of the things lost from the region as a result of the oil spill. 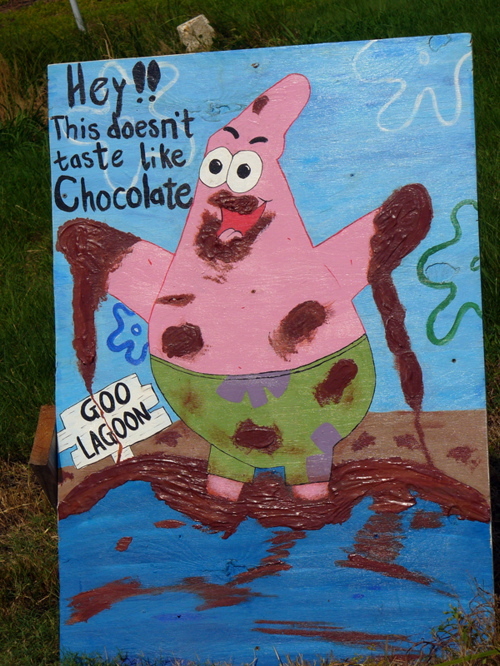 SpongeBob’s humorous sidekick, Patrick the starfish, mistakes BP’s oil for chocolate. 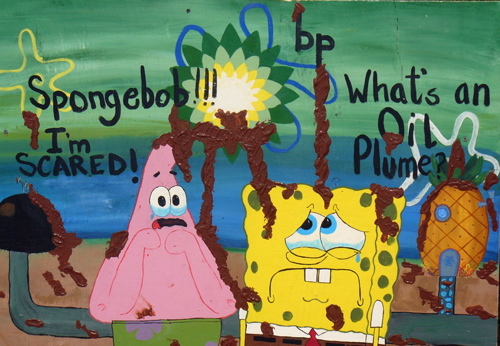 This is one of a series of signs posted along the main drag coming into Grand Isle featuring the crew from Bikini Bottom. Oil descends upon Bikini Bottom – a similar feeling the residents of Grand Isle are feeling even on dry land. A plea heard round the island and across the Gulf Coast. When can we go fishing, eat seafood, not find oil soaked pelicans, and walk on our beaches again? Frustration boils over in Grand Isle. 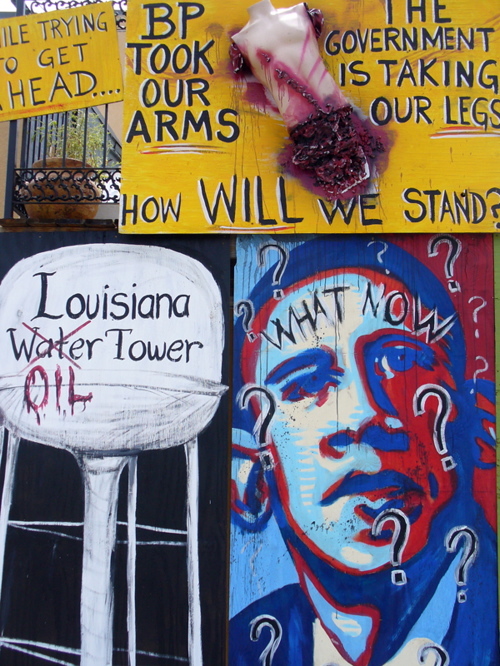 This entry was posted in Events, News, Politics, Travel and tagged BP, BP Oil Spill, Grand Isle, New Orleans, oil spill. Bookmark the permalink.